The Kathu area of Phuket is where I live. It's not far from Patong Beach (just over the hill on the way to Phuket town) and if you wish to get away from the most touristy beach in Thailand, get on a bike and ride over that hill past the temple on the hill, down to a quieter, largely residential area with a lot of history (Kathu was the center of the tin mining industry, and the famous Phuket Vegetarian Festival originated here). The daily Kathu market is worth a visit and you'll find temples in and around the village. But there's more! If you turn left at the lights next to the Caltex gas station, you pass the market and are heading towards Loch Palm Golf Course and the old Kathu village when you will see a left turn to Kathu Waterfall (Nam Tok Kathu). There's actually a fair amount of new houses around this area - Kathu is getting quite popular! The road up to the waterfall winds along for several kilometers. It's all residential with houses old and new, and lots of small shops and restaurants. 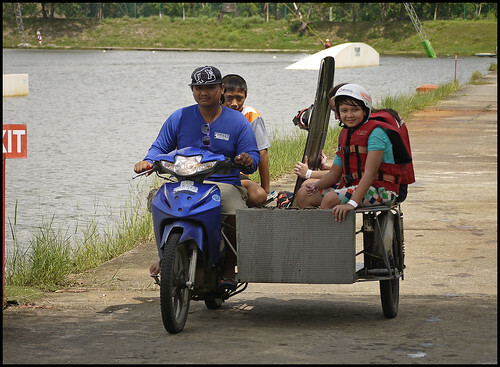 Along the way you pass the entrance to the Phuket Wake Park. 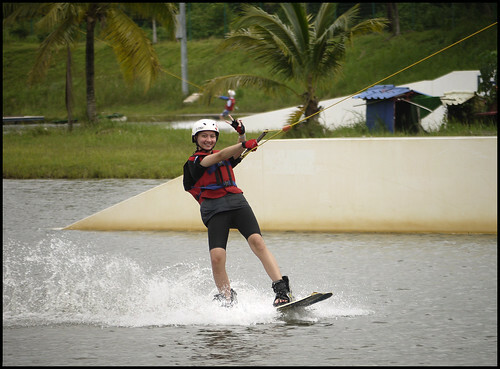 It used to be called Phuket Cable Ski - but was rebranded with new owners (Russian, I believe) a couple of years ago. There's plenty of parking, and a wakeboard shop outside too. We tend to go at weekends, which are busier, lots of kids of varying levels of ability. The serious dudes tend to be there outside the busy hours, but every time I have been there, we've seen some more experienced folk too, doing flips, jumps and other fancy stuff. Never tried myself, not my cup of tea and I am a bit big these days ... though I have been rafting on the Zambezi and raced bicycles downhill at 80 kph in the Pyrenees... when I was younger! Quite happy to watch my kids now, they like to try all kinds of sporty stuff. The prices are reasonable I guess - 750 Baht for 2 hours or 1600 Baht for a whole day (adult rates - kids are 450 Baht / 800 Baht). There are also long term rates. We normally let the kids do 2 hours and they are tired enough after that. There are some boards, helmets and life jackets for free rental, though I guess they are not the best ones! There is some better gear you can pay to rent. 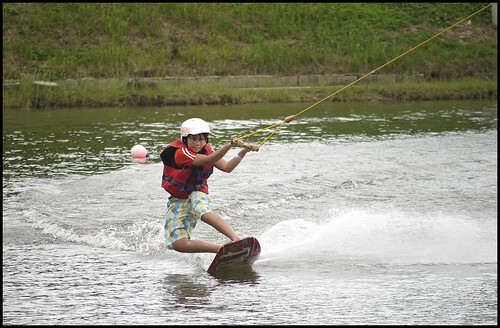 Our daughter does have her own wakeboard now. 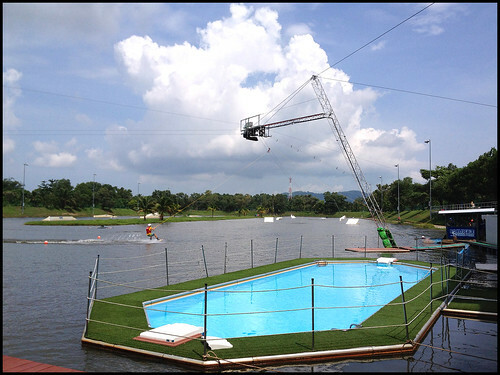 There are a couple of other wakeparks in Phuket which opened a little more recently. The Anthem Wakepark we have visited a few times, a bit more expensive, certainly seems to cater to what I might call the "international school crowd", but has good facilities and an indoor climbing wall on site too. 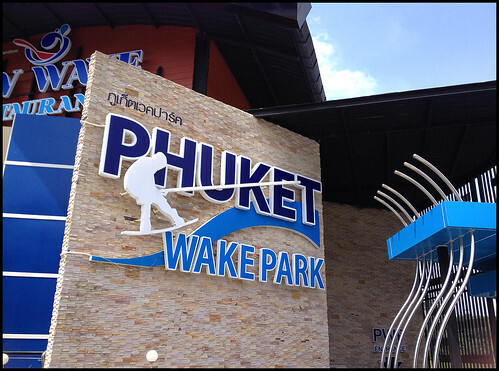 And there's the new Phuket International Wake Park near the airport.